The dilemma is simple. There, on the ground in front of you, is the icon of your faith. All you must do is desecrate it — trample it, spit on it, blaspheme. Then you shall be free; all those who follow the faith with you shall also be free. Not hung over pits to bleed out, or wrapped in mats and burned alive. But the point of having a faith is to be able to avow it. You can disavow, but at the cost of spending the rest of your life being unable to avow freely. Or you can cling to your faith, and watch as others die for your stubbornness. What is to be done? This is the dilemma at the heart of Shusaku Endō's Silence, his 1969 novel about the persecution of Christians in Tokugawa-era Japan. I consider myself areligious, but not indifferent to matters of spirit; my own path is probably closest to the Sotō variety of Zen Buddhism. I feel more affinity for individual expressions of faith than I do any collective manifestation of it. That might be why Endō's novel struck me in unexpected ways, and why I found fascinating dimensions in both its movie adaptations — one by fellow Japanese director Masahiro Shinoda, and another by none other than Martin Scorsese. Rodrigues and the "Grand Inquisitor", Inoue. Endō was a Christian and a Japanese and a novelist and an artist, all in proportion. The Christian part of Endō endowed Silence with sorrow for those who were punished merely for wanting to believe, but the rest of Endō imbued the novel with a sense of irony and tragedy that is cosmic and transcendent of any one variety of faith or doubt. Like Graham Greene or Georges Bernanos, Endō sought not to convert with his fiction, but to dramatize, to embed his story of a specific faith in a specific time in things that are universal and open-ended. 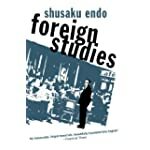 But Endō was also informed by the postcolonial thinking of the 1950s France where he studied, and both Silence and his other novel Foreign Studies are informed by an understanding of how the Catholic Church's expansionism led to backlash, how its machinations in spreading the gospel were themselves a refutation of it. Some have criticized the book on theological grounds, but Endō's statement is that he was writing literature, not theology, and in response others have pointed out how Greene, too, was forever branded as (in a paraphrase of his own words) a Catholic novelist, rather than a novelist who happened to be Catholic. The novel follows two Jesuit padres from Portgual, Sebastian Rodrigues and Francisco Garrpe, as they leave their home and journey to Japan to find their mentor, Christovao Ferreira. Word had it that Ferreira had spent three decades in Japan, a career cut short after the Tokugawa Shōgunate demanded the expulsion of all Christian missionaries from the country in 1614. But Ferreira never returned home, and so Rodrigues and Garrpe are determined to find out what happened to him, against the better judgment of their own superiors. Rodrigues and Garrpe smuggle themselves into the country, by way of a drunken sailor named Kichijiro — a pathetic figure, an exile and an ex-Christian who buried his faith in the face of persecution lest he end up dead instead of merely broken. One coming ashore, the two padres are almost immediately set upon by peasants who have continued to keep the faith alive. The two know that by ministering to those who long for a pastor they are exposing both themselves and others to terrible danger, but they can't turn away those who come sincerely. Then the authorities begin to close in. Some of the worshippers are rounded up, and told to renounce their faith or die. From the outside, it doesn't even seem like a dilemma: all they have to do is trample on an image of the Virgin Mary, or spit on the cross, or commit some other unambiguous blasphemy, and they will be left alone. It's easy to think that everyone who knows you, really knows you, will know you haven't really forsaken God. The authorities even put it in so many words: "It's just a formality." But it isn't. The whole point of holding the faith is to be able to say that you do, to both yourself and others. Being blackmailed into having to lie about it is not faith. And so some of them cannot bring themselves to betray both their comrades and the faith, and so are burned or crucified or drowned. Inoue offers Rodrigues the same deal as his would-be flock. Renounce the faith, he tells him, and you'll live the rest of your life in comfort. Hold out, and not only you but others who would throng to you will suffer. Rodrigues longed for martyrdom, and now he's got it — but on terms that make it an abnegation of his faith, not an affirmation. Is he being devout for allowing others to be tormented and die, or just selfish? He has to face the possibility that turning his back on God might be the only way left for him to affirm God, especially after he finds the truth of what happened to Ferreira. The other man apostatized, and now lives quietly with a Japanese name and a Japanese wife. And now Rodrigues must decide if he will choose this path, or a martyrdom that everything he's been through up to now cannot prepare him for. His great leap of faith, to use Kierkegaard's term, is forced to become its disavowal. Meeting Ferreira once again (as played by a Japanese rather than a Westerner). The role is not a large one, confined mostly to the end of the film, but pivotally important, a la Marlon Brando's Kurtz in Apocalypse Now. Consequently, it's impossible not to pay twice or even three time as much attention to Tanba in the role. The filmmakers chose to allow Tanba's facial hair and brows to grow out and cover most of his face, but there's clearly been other attempts to disguise his Asian features by way of makeup. Japan does not necessarily have the same taboos about actors playing against ethnicity that exist in the West — the reception there of the live-action Ghost In The Shell is good evidence of that — but that doesn't mean the choice is automatically without controversy. What's curious is how it's more the voice than the face that gives him away, as Tanba's lines are mostly delivered in thickly accented English. But that in turn makes us wonder: Is this a way for Shinoda to make us consider how completely Ferreira has apostatized and "gone native"? I don't know if that was Shinoda's intention, but it works as a curious by-product of having Tanba in the role. The rest of Shinoda's movie is not nearly as confrontatory in terms of its filmmaking (although the subject matter is another question). Shinoda does not attempt to inject much self-conscious "cinema" into the action, but instead looks for opportunities to point his camera at the faces of his actors and let that be striking. In one scene, an old woman whom Rodrigues is ministering to describes in horrible detail the torments meted out to the faithful. Shinoda does not, say, cut away and show us flash shots or freeze-frames of what's being described, as someone like Kinji Fukasaku might have. He lingers, if at arm's length, on the woman and her story instead. She is more than enough to point a camera at. There are very few elements in the film that really call attention to themselves. One is the musical score, by Toru Takemitsu, the composer whose career in film scores is at least as distinguished as his career as a "serious" composer generally. His work here brings to mind the European liturgial music of the period, but shot through with the dissonances and percussive punctuation that are also his hallmarks. (His score for Kwaidan was almost exclusively those things.) Another attention-getting moment is right at the end, when we see the last details of Rodrigues's fate, and there it's the kind of door-slam on the film that is worthy of a little cinematic self-indulgence. Rodrigues and Garrpe are played by two relatively unknown English-speaking actors, David Lampson and Don Kenny. I was uneasy about them at first — Japanese movies have a bad reputation for casting unknown English speakers who are lousy actors — but they acquit themselves well enough. Lampson in particular is good, especially as the role requires him to become all the more hollowed-out and bedraggled. His spoken Japanese is stilted, but that makes sense in the context of what we're seeing: this isn't their land, and on some level they know it. The god they have brought here is only their god. The believers and their persecution. It's hard to think of a more consistently excellent living director than Martin Scorsese. As earthy as his films are, they are stepped in guilt and recrimination of a depth that can only come from being brought up with it, and that vein of emotional power flows most strongly two two films of his that are about the unity of doubt and faith in Christianity. Both movies proved unrelentingly difficult to get made. The first was The Last Temptation Of Christ, which only made it to theaters at all because Scorsese accepted severe cuts in the film's budget when its original distributor pulled out. Fundamentalists protested the film on principle, in the same way they had reviled its source, Nikos Kazantzakis's novel. It was all terribly ironic, given how book and film alike took their subjects seriously enough to show how doubt was part of the process of faith and vice versa. Silence, the novel, also inspired in Scorsese the need to depict that dichotomy, to be true to it and not sugarcoat it. Scorsese visited Japan in 1989 to appear in Akira Kurosawa's Dreams as Vincent van Gogh, read Silence during that time, and was determined at some point to film it. He bought the rights to the book and hung onto them, but it took decades for the stars to align, the legal issues attached to the project to be resolved, and some $21 million in funding to come through. Three name actors — Andrew Garfield, Adam Driver, and Liam Neeson — all signed on to do the project for what amounted to minimum wage. The end result is unabashedly an expression of Scorsese's own faith, but also an acknowledgment of all the ambiguities such faith includes and necessitates. Scorsese's Silence runs longer than Shinoda's — two hours forty minutes, versus a mere two — but not pointlessly so. It adds back in more of the prologue and lead-up that Shinoda's version omitted; it shows the padres recruiting Kichijiro in Goa; and it goes into more detail about what happens to Rodrigues (and Kichijiro, too), as per a portion of the book that Shinoda's film omitted. Those changes make it come off as as less grimly cynical, but no less self-conflicted. Scorsese provides us with slightly more hope for his characters than Shinoda, although I worried that for some, this decision would tip the film over into being a tract rather than drama. Shinoda had a good eye and used it well, but Scorsese's use of cinema's devices has always been master-class. The technical quality of even the most minimally budgeted movie is orders of magnitude better today than it was forty years ago, but it's still nothing without talent. There's restless energy even in the scenes where the characters do nothing more than sit and engage in verbal fencing matches about the validity of their faith and the sovereignty of their countries. Restless, but not distracting: this is about enhancing what we see, making it sink in all the more, not compensating for it. Scorsese also manages not to make the movie look too picturesque; the seasides and countrysides in the film look gloomy and forbidding, not bucolic. What makes the movie most approachable to a modern audience, I think, is the casting: Garfield as Rodrigues, Driver as Garrpe, and Neeson as Ferreira. Most of the burden of carrying the film falls on Garfield's shoulders, but he is more than capable of it. Driver I have grown all the more fond of with every role I see him in. Some of that, I confess, is because he's not conventionally handsome; he's gangly, awkward-looking. But that also makes him look approachable and human, not blandly Photoshopped, and here it makes him all the more fragile and vulnerable. And then there is Neeson, one of those actors who embodies an emotional note — in his case, a warm avuncular presence — but here he uses it to quietly horrific effect, especially when he utters the line "You are now going to perform the most painful act of love that has ever been performed." The Japanese cast shouldn't go undiscussed here, either. Best known to me among them is Tadanobu Asano, one of my favorite of all modern Japanese actors, who plays the unnamed role of Rodrigues's interpreter. Asano is like water; he fits almost every role he's poured into, good men and sinister monsters alike. Here he is a combination of both extremes, as in the scene where he smiles casually and tells Rodrigues, "It's only a formality," as the other man prepares to commit the greatest betrayal of his life. When talking about any two projects like this, there is always the temptation to rank them, if only for the sake of making a consumer recommendation. The Scorsese version is easier to come by and more generally accessible for all the reasons I've outlined above — familiar cast, modern filmmaking sensibilities, etc. By most any standard it's the better film. But not in the sense that it makes Shinoda's version obsolete. It has more to offer than just stunt casting, and was made by people who took the material seriously, one of them being the author himself. It's no less a part of the conversation that includes the original novel, and Scorsese's film, and a great deal that came before all of them as well. "You are now going to perform the most painful act of love that has ever been performed."